Robin: Aren't you one of those guys? Robin: Those guy guys, you know, those guys with skills. Robin: Yeah. You send them into the wilderness with a pocket knife and a Q-tip and they build you a shopping mall. You can't do that? Unfortunately, Harrison Ford was not one of those "guy guys" in Ivan Reitman's 1998 screwball comedy adventure that found Indiana Jones and Anne Heche stranded on a desert island. And although eventually he was able to fix the crash-landed plane in the third act, had Tinker Bell been on the scene, she would've had them back in the air and begun building that shopping mall as soon as the plane touched the sky. Whether she's given a playing card or a rubber band to concoct the motor in her brand new Pixie Dust Express which both floats like a wild power boat and later flies like a hot air balloon in this film, we're quick to realize that this Bell is called Tinker for a reason. 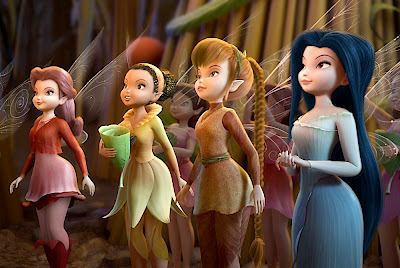 Following up Walt Disney Studio's immensely popular 2008 premiere Tinker Bell which introduced us to the Peter Pan character in her own satisfying spin-off that reached "the year's number one spot as the biggest Direct-To-DVD release of 2008," this hotly anticipated sequel is just the second entry in what Disney has announced will ultimately consist of five fairies installments. Yet while admittedly the storyline of the original delightful title was a bit uneventful overall, nonetheless it was vital in establishing the background of our blonde, feisty, green dressed heroine who uses her talents in tinkering to help her gifted friends and fairies with whom she resides in Pixie Hollow. 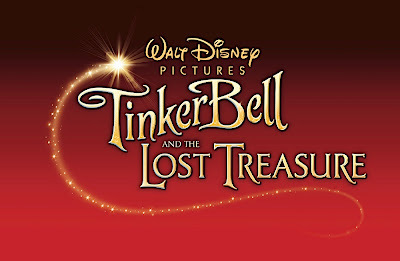 Fortunately, now that the back-story, setting and supporting players have all been established (yet not to the point where you can't watch Lost Treasure before you've seen Tinker Bell), this fast-paced, painstakingly detailed CG feature length work hooks you immediately as a great children's adventure story. Likewise, because it wasn't transferred from a film print, the CG source material springs to life in a Blu-ray so breathtakingly gorgeous that at times, I simply stared in awe in this nearly 3-D work that not only surpasses the original but sets an amazingly high bar for both Disney and its competitors. 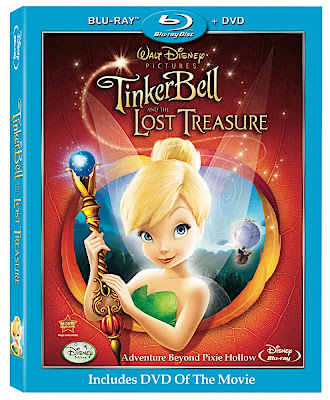 Stunning proof that Direct-to-DVD doesn't have to mean low-quality, Tinker Bell and the Lost Treasure would've been tremendous viewed in a theatre with digital projection. Even if you haven't seen the first one or swear that Tinker Bell isn't your speed, it's one that Blu-ray owners will definitely want to experience to show you what a difference the format itself makes when the clarity is razor sharp. Likewise it also provide the necessary discovery that not all Blu-rays are alike when it comes to quality. 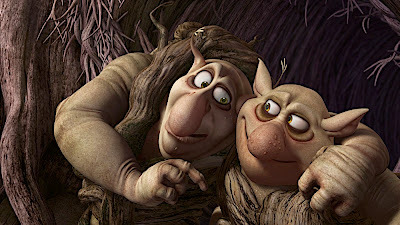 Needless to say, the film meets all of the child-friendly requirements in its 80 minute running time that consists of Tink's traditionally valuable morality lessons regarding friendship and honesty delivered via original songs and scene-stealing funny sidekicks. 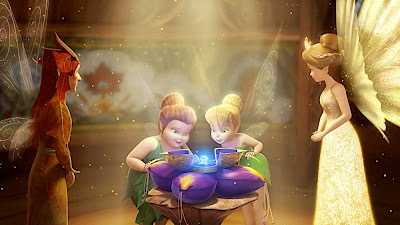 As the fairies of Pixie Hollow prepare for the Autumn Revelry that coincides with the rare appearance of the Blue Moon, Tinker Bell is given the important task of creating the Fall Scepter with a precious moonstone to ensure the moon's light will pass through to restore the Pixie Dust Tree which is their lifeline. Working with her best friend Terrence who delivers fairy dust from the depot, Tinker Bell's calculation and design coordinates pay off brilliantly. Yet when disaster strikes both the Scepter and the moonstone, she ventures to Never Never Land to try and fix the mess that has put her Pixie Hollow loved ones in peril. 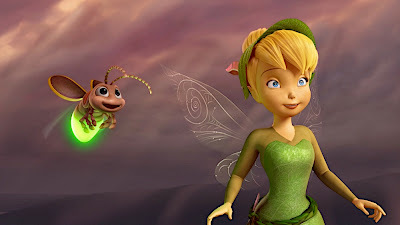 Moving back into familiar territory for fans of Peter Pan, soon the story becomes a hero's journey paradigm as Tink meets an adorable, protective firefly named Blaze and encounters several more obstacles on her quest. With striking animation on a cinematic level, the film manages to sustain its irresistible momentum via several inventive scenes which easily transport you into feeling as though you're aboard the Pixie Dust Express, which is sure to make an entertaining ride at Disneyland. Since the review copy I received consisted of the studio's budget friendly combo pack that contains the film and all of its extra features in both Blu-ray and DVD to ensure you won't have to buy it twice, I was granted a unique opportunity to compare the technical details from DVD to Blu-ray. While the digital medium still ensures you receive a striking picture on DVD as that's the way I'd actually viewed the first Tinker Bell when it was released last year, the effect is much flatter on the screen than the visual eye candy of the Blu-ray which as I mentioned earlier, is sure to impress all viewers who want to see what their Blu-players can do. 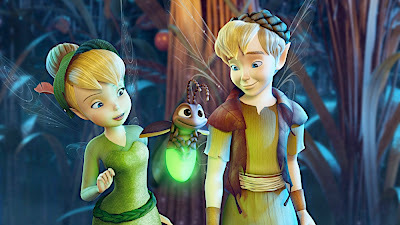 With a riveting plot line and far more action along with the pathos and emotion Disney effectively blends together repeatedly, Tinker Bell and the Lost Treasure is sure to convert even more viewers to the fairies franchise than its predecessor. Rated G but of particular interest for early grade school students to fully appreciate some of the film's messages, additionally the emphasis on girl power makes it perfect for young women just starting school since it goes against the gender stereotypes we have regarding math and science. For, in the Pixie Hollow tales, it's so refreshing to see a young brainy female engineer who employs math, science and an astute knowledge of mechanics regarding "the way things work" that makes it a breath of fresh air for a studio most famous for princesses who aren't typically known for their IQs. Of course, every young girl enjoys the princesses but thanks to the new fairies line, we're realizing there's much more to the previously voiceless Tink than we ever would have imagined.